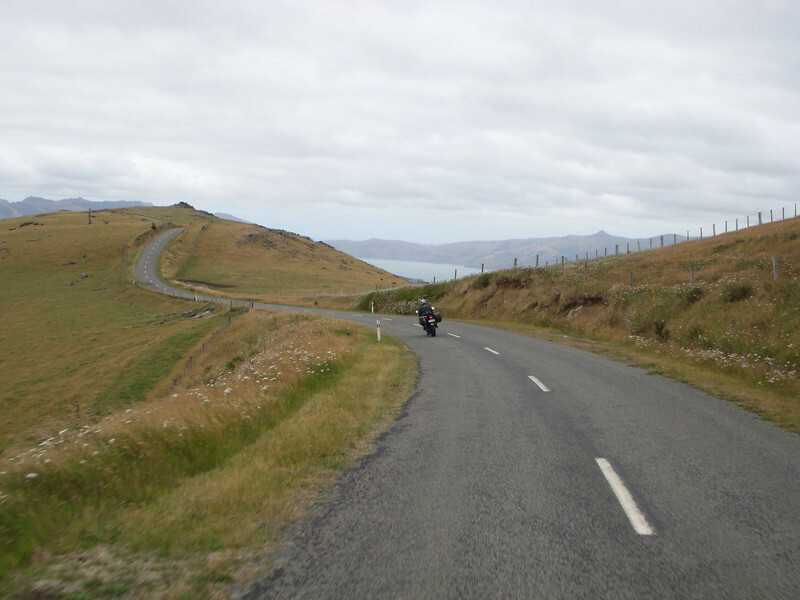 Feb 14 2009: First ride in NZ! 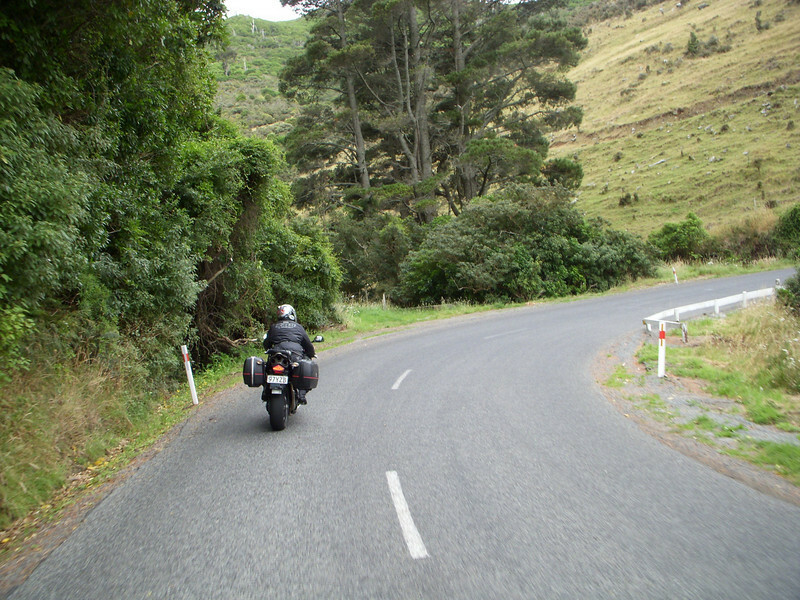 Sat Feb 14 2009: First ride in NZ! Alright, screw this snow and ice stuff. 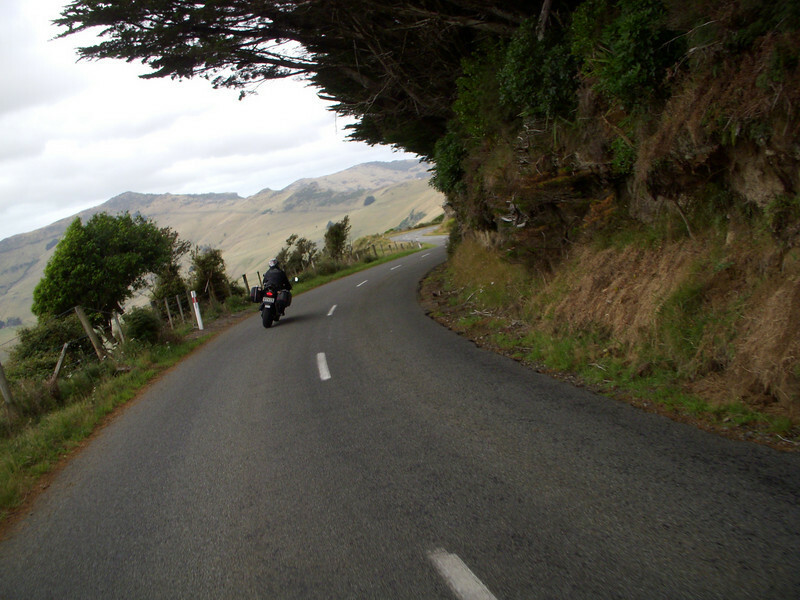 We're going to New Zealand to ride motorcycles. Who's in? 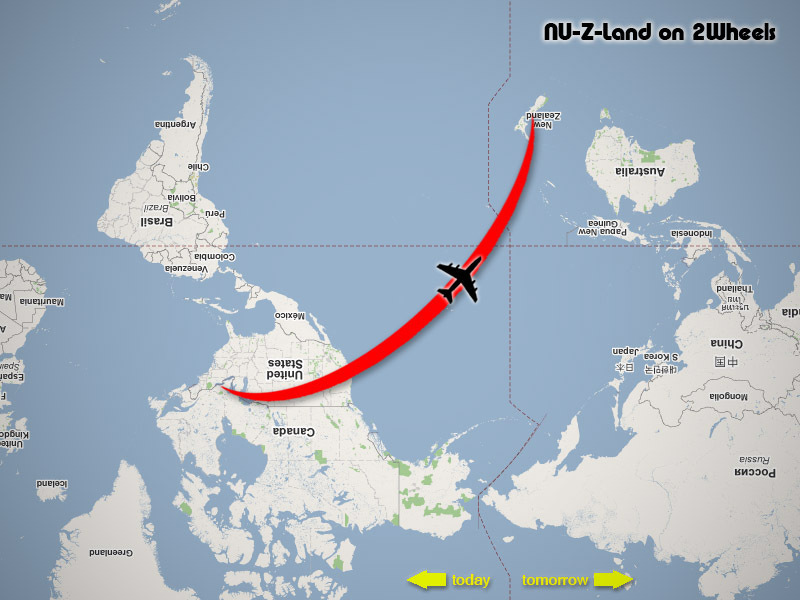 Through some weird International Dateline trickery, we lose a day while travelling from Canada to New Zealand. We arrive early in the morning in Christchurch, which is on the east coast of the South Island. The taxi ride from the airport through suburban Christchurch reminded me of a lot of the towns in England. We check in at Eliza's Manor, which is a nice English-style B&B just outside the downtown core. Ann, our hostess, cooks up a great breakfast and shows us to where the rental company has parked our motorcycles! How's that for service! 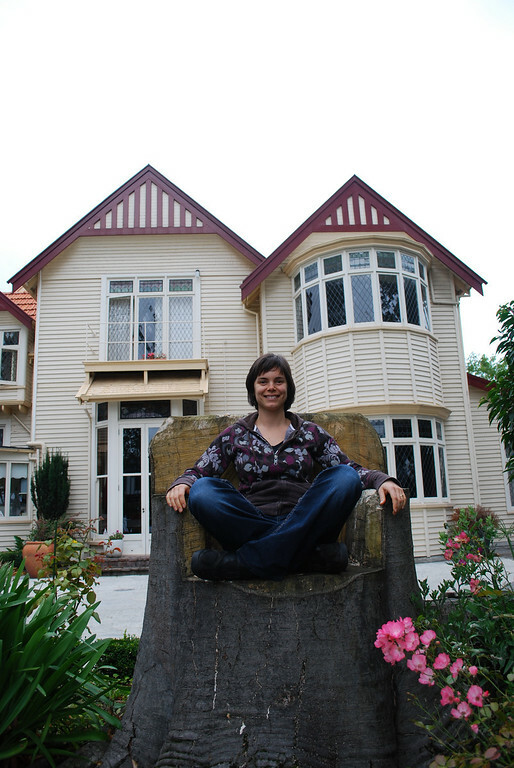 Sitting in front of Eliza's Manor. 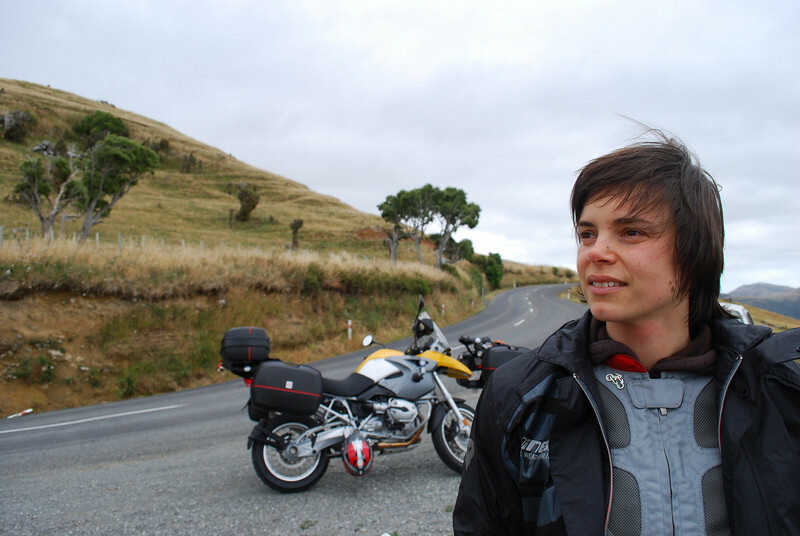 Neda has rented a 2006 Triumph Sprint ST 1050, and I've got a 2007 BMW R1200GS. 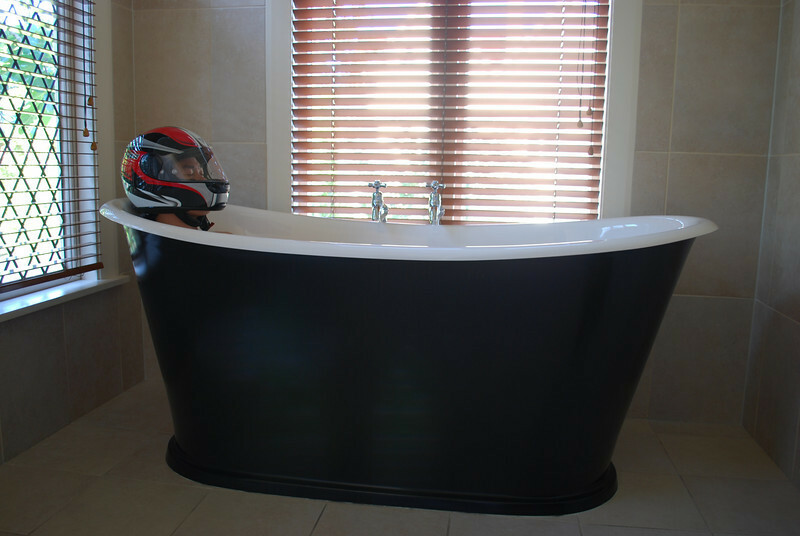 Yep, almost exactly like the one I have at home. 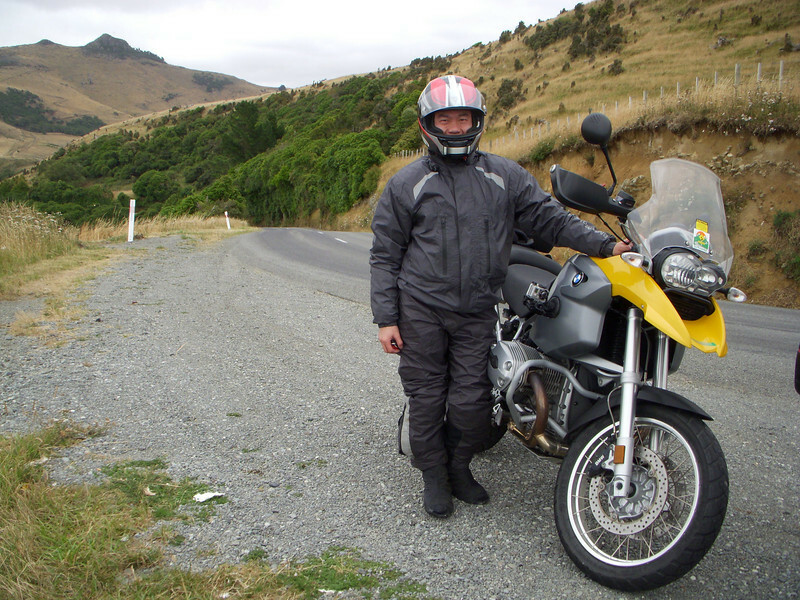 This is high season for motorcycle rentals in NZ, so when I booked last summer, the Beemer was the only interesting rental left. Oh well, at least it's something I'm familiar with. 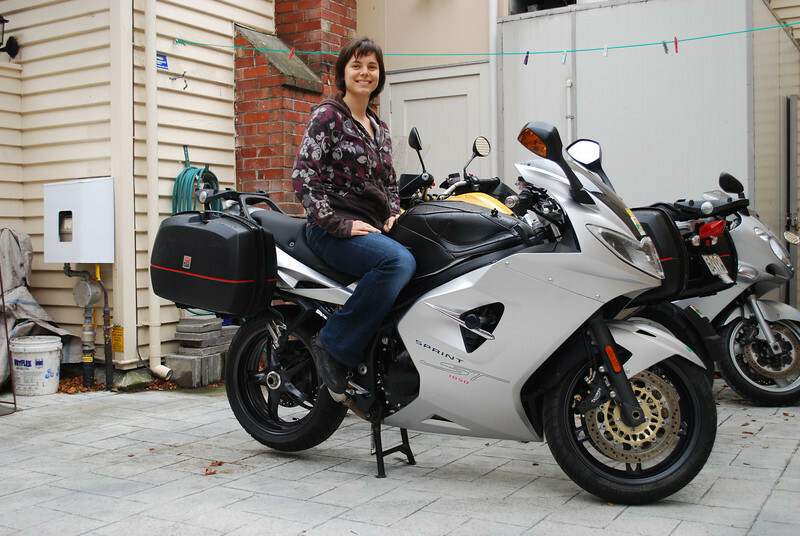 Both bikes come with Givi panniers and topcase, except for the Triumph. I called the rental company and there was a mistake in the shipping, so they'll courier a topcase to the next city we're in tomorrow. 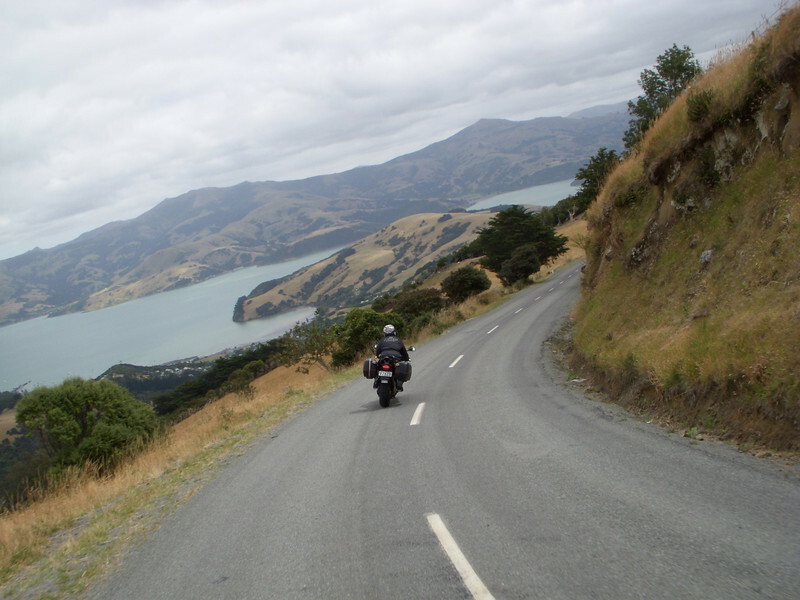 We're itching to go riding, so we ask Ann where some popular riding spots are around Christchurch. 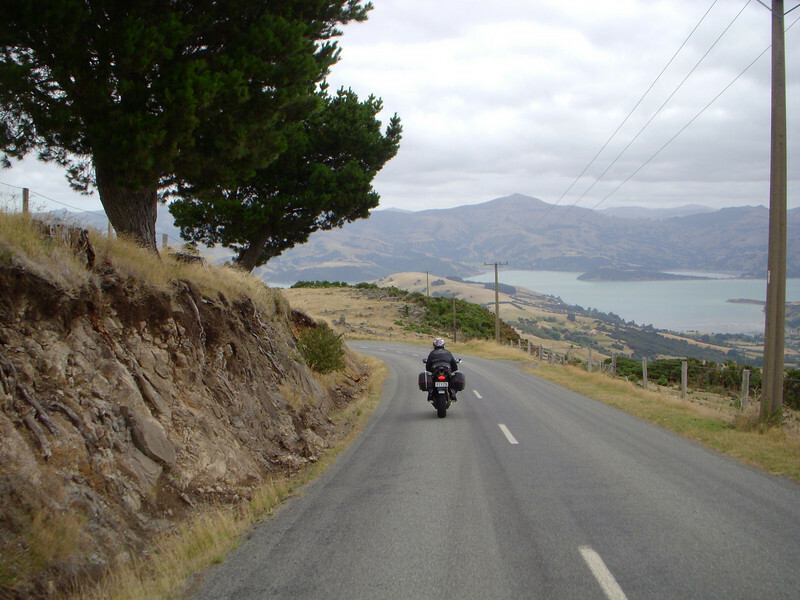 She points out a nice twisty road in Arakoa, about 80 kms south-east of Christchurch. 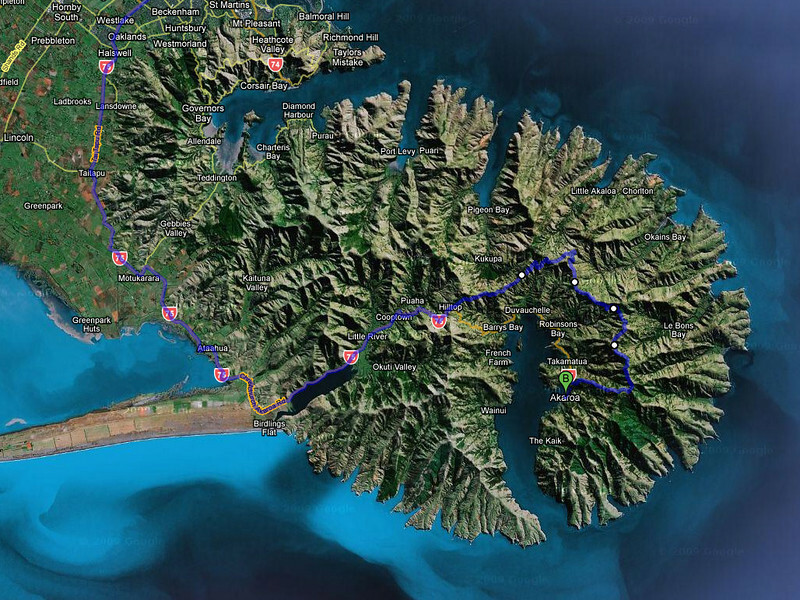 Turns out Arakoa Harbour is actually the caldera of the crater of an ancient extinct volcano, and the best road is the one that straddles the lip of the volcano, so you can see the harbour waters on the inside. Sounds like a plan! 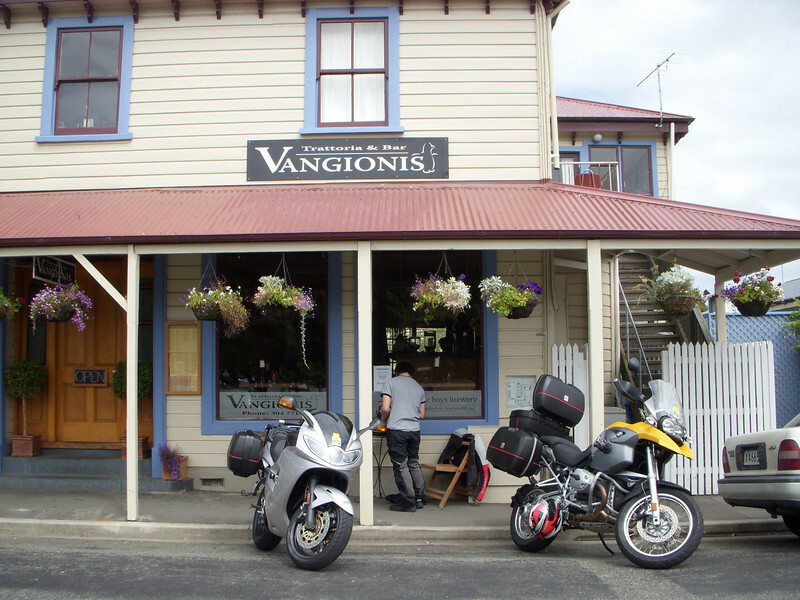 We fire up the bikes and mentally prepare ourselves for a day of left-hand-side riding. Every lane-change and turn is a constant reminder to "KEEP LEFT!" There's even a "KEEP LEFT <---" sticker on the handlebars of the bike that the rental company has put on, just for North American tourists! We start off very slow just to shake the cobwebs from the last few months of being off the bike. Feels great to be riding again! Too bad the weather has turned very cold in Christchurch today. Ann told us that they were in the 30s for the last couple of weeks. And when we arrived this morning, it was 8C! %$%! @, it was 8C when we left Toronto this week!!! Also, 5 minutes after we left the B&B, it starts raining! OMG, it's like Toronto 2008 all over again. A quick pullover (TO THE LEFT) to don our rainsuits and we're off again. 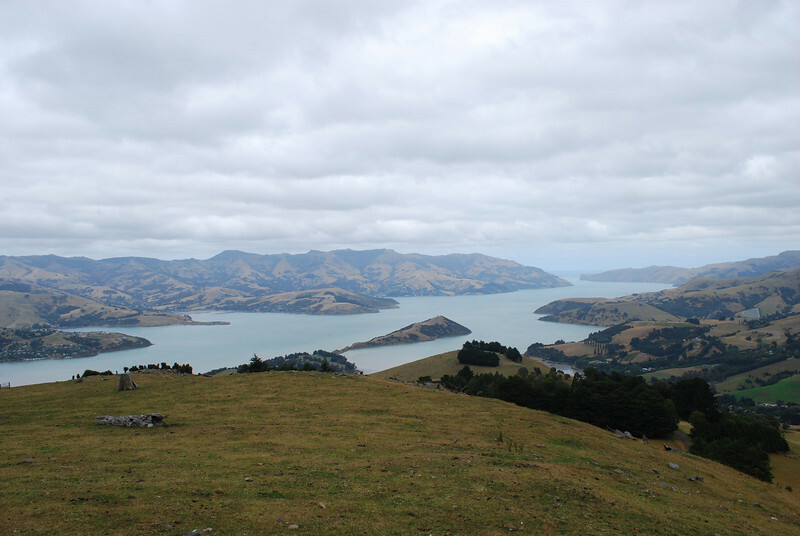 Akaroa Harbour. Looking into the crater of the volcano on the left. Once we get off the main road, which gets to be pretty twisty itself as it approaches Akoroa, we take the "tourist road" which winds itself around the lip of the volcano. Very twisty with great elevation changes. Everytime we go down, we get to see amazing vistas of the harbour inside the caldera of the crater. 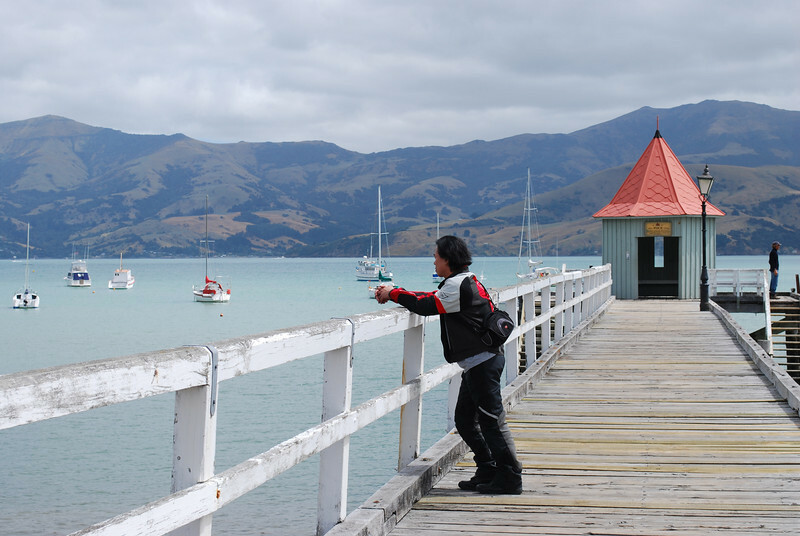 We stop in Akaroa for a late lunch and walk around the quaint town, shopping for knick-knacks. We're going to try to stay awake till 9PM tonight, just so we don't wake up at 3 in the morning, waiting for the sun to rise so we can hit the road tomorrow!